In food-obsessed San Francisco, Bar Agricole is a must-have reservation. That's largely thanks to San Francisco Chronicle reviewer Michael Bauer, who named the restaurant one of his top three newcomers redefining fine dining. But major thanks also go to Aidlin Darling Design, which reinvented a corrugated-zinc warehouse from 1912 as a hip temple to aesthetics at once industrial and crafted. It's identified as a "modern urban tavern" on Bar Agricole's own Web site. Joshua Aidlin, for his part, talks about "exuding permanence and the sensuality of the human hand." Gutting and retrofitting the three-story interior, Aidlin Darling completed the project in two phases, for separate clients, under very different circumstances. First came an upstairs office for the property's owner-developer, Matarozzi/Pelsinger Builders, tenant space. A year and a half later, restaurateur Thad Vogler leased 4,000 square feet on the ground level, and Aidlin returned as lead architect with David Darling on the sidelines as editor. (The two partners always split their firm's projects.) This time, however, Aidlin didn't simply sign on as talent for hire. Vogler's creative counter to the recent economic doldrums, a period that has seen restaurants shuttering faster than opening, was to reduce the need for conventional investors by instituting a design-dining co-op. Aidlin Darling and a group of craftsmen in wood, metal, and glass would put their sweat equity into the interior and end up as part-owners. They can now toast their joint accomplishment over Bar Agricole cocktails spiked with dill and fennel grown on the cedar-enclosed dining patio. Aidlin sacrificed half the front parking lot for this opportunity to bring the restaurant outdoors-San Francisco's sunny days may be few and far between, but it dazzles when they occur. Then he and a metalworker on the team gave the entire facade a scrim of perforated corrugated zinc, a visual taste of what's to come. Using concrete and oak as foils for each other, the interior walks a delicate line between tough and inviting, cool and warm. A suspended canopy that runs the length of the space, bringing down the scale of the 18-foot ceiling, is clad in strips reclaimed from whiskey barrels. The same strips surface the adjacent sidewall. "We mocked it up 10 different ways and finally settled on a fish-scale effect," Aidlin explains. "Then we nailed the strips to the plywood. It's very low-tech." Together, the two perpendicular wooden surfaces remind him of a boat's hull upside down. Oak from 100-year-old barn beams and Napa Valley wine casks can be found, meanwhile, in the form of the simple tables and chairs in both the main dining area and the private dining "grotto." The latter is down a split level, alongside the kitchen and back-of-house. For the floor, concrete was a foregone conclusion, installed and polished by a contractor in the partnership. The two bars have bases of board-formed concrete. It's topped by oak at the cocktail bar in front and at the central coffee bar, which doubles as a service station. But concrete for restaurant seating? It turns out that the bar area's ribbonlike banquettes are comfortable enough for a multicourse meal. That's because Aidlin, who's also a fur­niture designer, added oak seats to the precast ductal concrete, lightweight and durable, and gave as much thought to ergonomics as he did to style. The third key material is glass provided by Nikolas Weinstein, a friend of Aidlin and Vogler who'd been working mainly in Asia and finally got to collaborate with them at home. "There were three skylights in this big, long space, and Josh had punched holes in his wooden canopy to let the sun through," Weinstein explains. His suggestion was to extrude the skylights down as billowing glass curtain sculptures suspended from the perimeter of the apertures. He started out with regular industrial tubes of clear glass, supersize versions of what you'd find in a chemistry lab. "They have more visual interest than sheet glass, and they're a lot lighter," he adds. To give the curtains their gentle curves, he thermoformed the tubes in a huge, scorchingly hot kiln at Nikolas Weinstein Studios. He also torched the ends of the tubes to create luminous accents at the bottom of each curtain before the tubes were woven together with stainless-steel cable less than 1 millimeter thick. The glass curtains' ability to amplify sunshine from skylights is one of the building's many eco attributes. 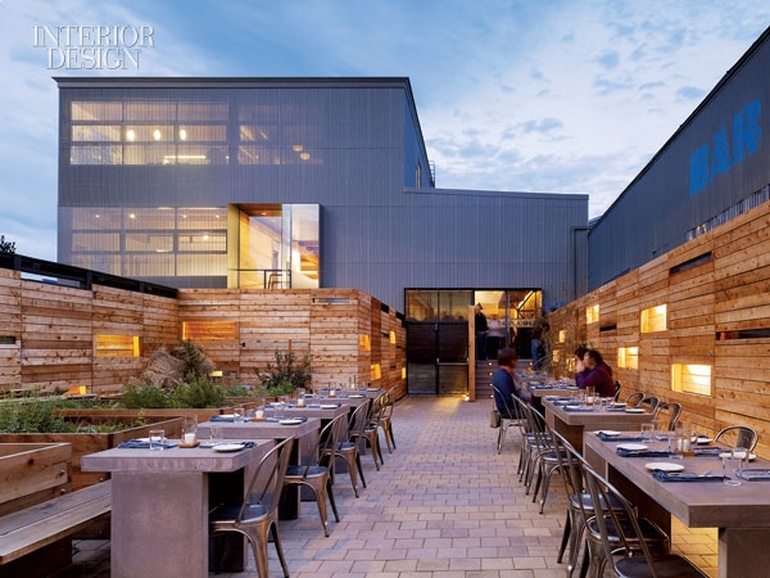 It already won a spot on the AIA/COTE Top 10 Green Projects list, and Aidlin Darling has now applied for LEED Platinum certification for Bar Agricole specifically. As for that other rating, the San Francisco Chronicle issued the restaurant three out of four stars for its seasonal menus of hand-grown food. roslyn cole (project architect); adrienne swiatocha; shane curnyn; adam rouse: aidlin darling design. revolver design: lighting consultant. simon & associates: sustainability consultant. charles m salter associates: acoustical consultant. berkeley structural design: structural engineer. mhc engineers: mep. chris french metal; swerve: metalwork. cabinet works co.: woodwork. metropolitan glass corporation; supreme glass company: glasswork. concreteworks: concrete contractor. cronin construction: landscaping contractor. northern sun associates: general contractor.